1. Is that's true..or it just a spoiler..? 2. Or it just SIC (Super Imaginative Cokogin)...? Nah, its just a concept form. Like, there were at least another 4 Riders that were supposed to make it into "Kamen Rider Faiz", but they ran out of time. 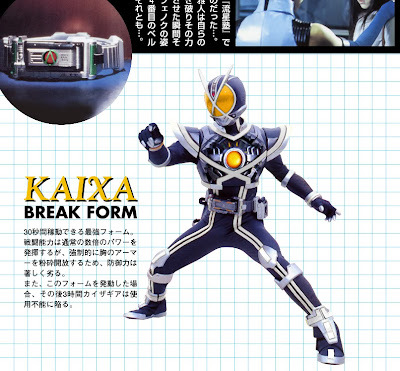 Three of those Riders only appeared in the stage show version (Alpha, Beta, and Gamma), and Kaixa Break Form didn't make it into the show due to time constraints just like Lambda didn't even get created due to time constraints. Considering "Kamen Rider Faiz" ended on a cliffhanger, its possible for it to be adapted into a second season, or into America and actually use all that concept work.